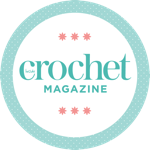 Crochet is a wonderful way to embellish a high street sweater, creating a garment as unique and beautiful as your imagination with this project from our 100th issue by Tracey Todhunter. Not a subscriber? Find this crochet pattern project in issue 100 of Inside Crochet, available to order online or download directly to your smart device. #WIN: Want to win the yarn to make this project? Visit our competition page. Designer biography: Tracey Todhunter is a knitwear and crochet designer specialising in homewares and small accessories. Visit her website at www.grannycoolcrochet.com for free patterns and details of workshops or follow her on Instagram @traceytodhunter for current projects and design inspiration.